I just wanted to really quickly share with you all this EASY pie I literally threw together the other day, when a pie was surprisingly needed! Pies always seem to "all of sudden" be needed! That or cupcakes. So funny. But yeah, this pie? It's honestly that easy. And it was a HUGE hit! I happened to have these ingredients on hand, but if you don't, they are very easily found at your local super market! 1, 9" defrosted store-bought pie shell, a well chilled homemade pie dough in a pie dish, or a boxed pie dough made according to box's instructions, in dish and well chilled. 1. Preheat oven to 350°F and line a sheet pan with tin foil. Set aside. 2. In a large bowl, mix together all of your ingredients except your butter. Next, with a fork, or biscuit cutter, cut in your cubed butter until it's mixed in with pieces the size of peas. Set in fridge. 3. Peel and core your Honey Crisp apples. If your store didn't carry Honey Crisp, any tart apple will do. Honey Crisp are known for their sweet, crunchy and tart flesh. Plus they are HUGE apples! Totally delicious! Slice into 1/4" slices and place into a large mixing bowl. 4. Mix apple slices with your all purpose flour and pumpkin pie spice. Next, mix in your 2/3 jar of salted caramel sauce. Mix to thoroughly combine. 5. Place well chilled pie dough (in dish) on your sheet pan lined with tin foil and pour in your apple pie filling. Next, top generously with your chilled crumb topping. 6. Bake uncovered for about an hour, or until juices are bubbling and top and sides are golden brown. **If crust is browning quicker than your filling is cooking, you can press pieces of tin foil onto the sides to stop cooking. 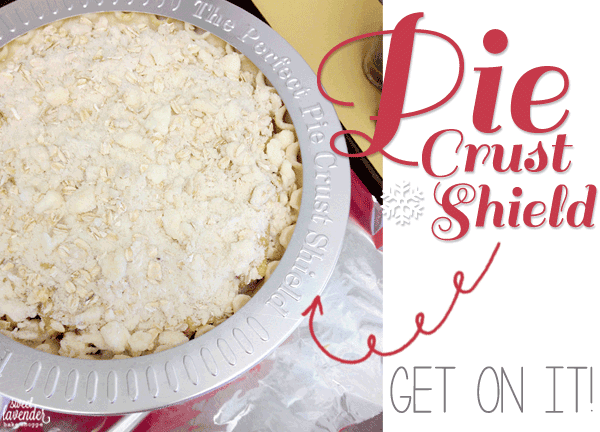 Even better: go find yourselves one of these pie crust shields and place onto of your pie before baking! It totally protects your crusts from burning while your pie bakes! It's a pie saver! I got mine from Sprout's Market for like $3! Allow to rest for about 15 minutes before serving. Or even better, allow to rest for up to 4 hours on counter! If making the day before, allow to cool completely before wrapping in plastic wrap and storing in fridge. The day of, allow pie to come to room temperature (or reheat in oven) before serving! Delicious with vanilla bean ice cream! 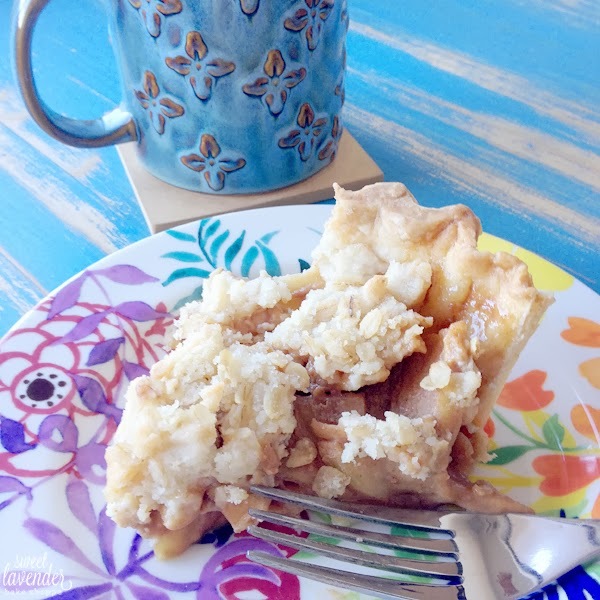 I may or may not have had this last piece of apple pie for breakfast one morning. What? It's got my fruit, dairy and carbs. A perfect trifecta! 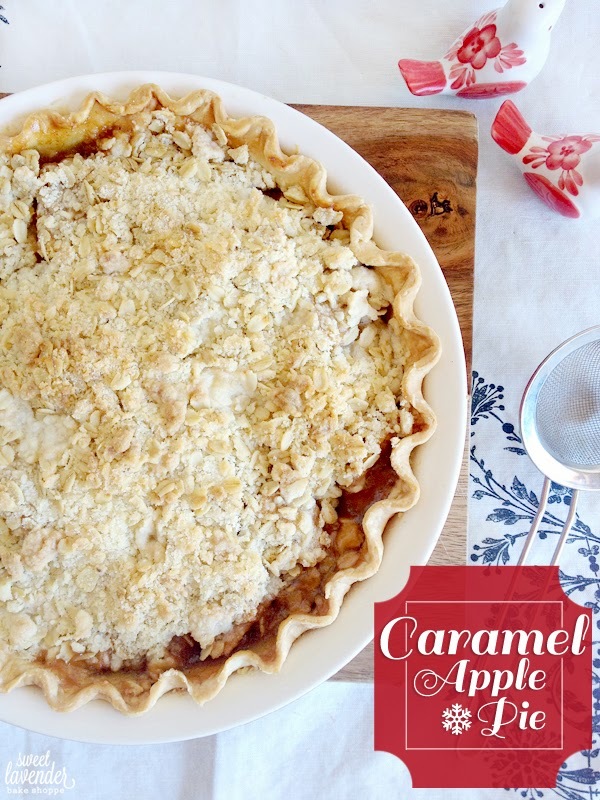 Caramel Apple Pie is definitely a breakfast of champions! So that's it for me for the next week! It's officially vacation week for us bloggers! As you probably already know, most bloggers take off the week of Christmas Eve to New Year's Day :) It gives us all time to catch our breath, rest, and spend time with the ones we love. So, until next year, I wish you all (my sweet friends) a VERY Merry Christmas, and a super awesome New Year! Be safe! See you January 2nd 2014 (so weird) with an awesome EASY PEASY Berry Cobbler recipe! :) And we start the whole year over again! Eeeeep!